It took me over a year of testing and formulating to find the perfect recipe for Solid Bubble Bath. It dries to a solid bar – but isn’t so hard that you can’t crumble it up with your fingers. Rolling up the bar is a little tricky to get the cute swirl in the center, but if you’ve ever made sushi or a jelly roll cake you will be a pro at this. And, nothing says you can’t start easy and just go with one color instead of the double color that I show in this video. Previous Post: Fair Ivy 2013: Sneak Peek! I made these and the came out beautiful but when I checked on them 4 days later they turned brown! what happened? I am in New Zealand and can only find tapioca flour and tapioca starch. 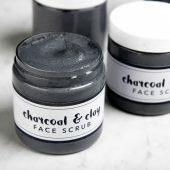 Can either of these be used in place of the modified tapioca powder in the bubble bar recipe? Hi, I made these bars a few days ago, and now they are drying but the look so strange. The outside color is a pastel green, and it looks like it has brownish veins running through it. Is this part of the drying process? Hello, I made these bubble bars and they looked great and made tons of bubbles. 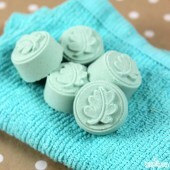 The only thing is the scent disappeared immediately when added to the water and was replaced by a play dough like smell. Is there something I’m doing wrong? Or anything I can do to fix this? Any help would be much appreciated!!! l try with no more than 1 oz of scent! And will check out the fragrance calculator!!! Also one more question. If I want the bubble bar to really color the water can I just add a little more colorant? Or is there anything specific I will need to do? I just made these yesterday and am thrilled with the outcome! They are gorgeous and I can’t wait to try new colors and scents. 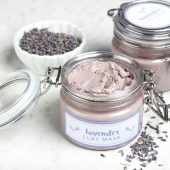 I was just wondering if it’s possible to add any additional moisturizers to this recipe? Thank you! I just made my second batch and I think I sprinkled too much baking soda on my freezer paper as it’s a bit dry but I think it will be fine. I also made a batch of bath bombs. 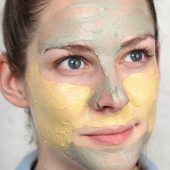 What is your recommendation for wrapping/packaging once they have “cured”? Hey, I was just wondering if I could substitute arrow root powder for corn starch? I actually used a fine sheeted piece of parchment and it turned out beautifully! I am really interested in making this recipe but I am allergic to SLSA but seem to have no problem with SLS. Would it be possible to sub SLS instead? I had a question….I noticed that when rolled up there was a flat side before being cut…kinda like a swiss roll…..what if i wanted to try and keep them round?? Like a pinwheel? Is it possible to place the bubble bar dough in the fridge to firm it up before cutting it? Keeping it firmer so it stays round? So new to this kind of thing…I’m a baker and that would be my natural inclination but this isn’t cookie dough…. hahaha! Might be a bit late but because the ‘dough’ is still quite soft after being cut you can lay each slice down on the cut side and gently shape each piece with a slightly cupped hand. Key word : Gentle. hehehe. 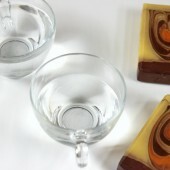 followed recipe: 7oz liquid glycerin, 1.8 oz castor oil & .7 oz fragrance oil. stirred until mixed like in video (measured by weight), next we measured our dry ingredients in a separate bowl (sifted), then put the wet ingredients in with the dry ingredients, mixed with spoon instead of whisk. we were supposed to divide dough in half to add colors. but it didn’t mix like a dough. I make toilet bombs and shower bombs to sell all the time and this acted more like those instead of a dough. I have no clue what happened. so you are saying even if I used a mica as colorant the liquid glycerin, castor oil and the fragrance oil should be enough liquid for the dough? we weighed out each liquid in a glass bowl using a scale and hitting the tare button each time. sifted dry ingredients in a separate bowl. then added the 2 together before adding colors. How strange! We’ve never heard of that happening before. Typically, the mixture forms a dough-like consistency even before the extra colorant is added. So, it should form a dough even with a dry colorant. My bars have been drying for almost 2 weeks now and it’s obvious there is too much glycerin in it. Parts of the bar have gotten dried and crumbly while other sides have the dreaded glycerin sweat. I was wondering if it would be feasible to just go ahead and smash all the bars back together and add in a little more dry ingredients to salvage these bars. I used some pretty expensive essential oils having high hopes for this recipe. I did a couple of another batches using a lot less glycerin and they are doing fine so I definitely suspect the glycerin. Oh no! These bars can be a little wetter based on the temperature and humidity of the area you live in. I was thinking about trying the oven method but am worried about “cooking” out my essential oils or make the bars less fragrant. Also, some of the bars were so moist they are basically little piles and mounds of dry and wet dough. Should I go ahead and reshape them before putting them into the oven or is all lost and these end up to be an ugly batch? Because the oven is preheated to a lower temperature and then shut off before the bars go in, I don’t believe it will “cook” the bars. The very low heat should help them dry out a bit. So as i collect the ingredients to make this wonderful bubble bar, I made a visit to my local lush to see how cost affective it is make vs. buy frequently (so much cheaper to make myself) . I tried a few things in store – including a bubble bar. 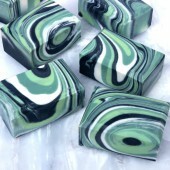 In it they added Shea butter and cocoa butter to give you an unbelievable softness to the skin and in the bath. 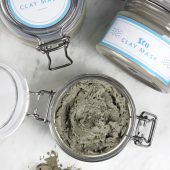 Wanting this benefit of hydrated skin especially in the cold season, i was wondering in what way could i put it into the recipe without changing its consistency too much. Not being able to try how the original bubble bar will turn out i don’t know if it has the same softness. As i did some research on castrol oil it didn’t seam to play a huge roll in the way your skin feels. We did a lot of recipe testing to get these bars just right. 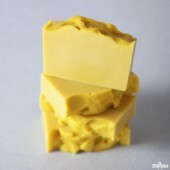 Adding extra shea butter and cocoa butter will change the consistency, so we don’t recommend adding it. 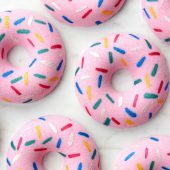 I’ve been interested in making bubble bars, but was wondering about the supposed patent on bubble bars that is held by Lush. I’m not all that great at reading through legal jargon, but I was wondering if you guys had any insight about any problems that might come up if someone wanted to make these and also sell them? 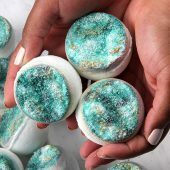 While I’m not familiar with a patent on Lush’s bubble bars, you don’t have to worry about making and selling these bubble bars! Thanks Kelsey! That does make me feel better. 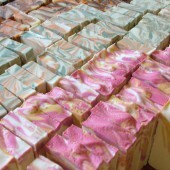 I am just getting into making my own bath products. I ordered SLS (not from Brambleberry :-() and it’s liquid. Is it supposed to be liquid? Can I still use the liquid? I will order from BB next time to get the dry, I’m just curious about liquid vs dry for this recipe. I’m not exactly sure! We didn’t test this recipe with liquid SLS, so I don’t know how it will act in this recipe. Because it’s liquid, it may make this recipe a lot softer. You may want to make a small test batch to see how it acts. Anne-Marie did a lot of experimenting to get these bars just right, so substituting the ingredients may not work too well. You may try tightly wrapping your bars in plastic wrap once they’re finished and keeping them in a cool place. That helps protect them from humidity. How long do these last before they expire or don’t bubble or smell as good? thank you so much for working on a bubble recipe! i have been dying to make bubble bars and got right to it. after i made a few batches and set them out they hardened within a week but i noticed after a couple of weeks they started to cry liquid from each bar. literally in small puddles underneath them and droplets formed on top of them. have you seen this happen and do you have an idea of what may have caused this so i can avoid it? thank you for any suggestions you may have!! If you’re living in a hot or humid climate, these bars can sweat because they have Liquid Glycerin in them. got it!! thank you for your reply and insight i really appreciate it!! Just wondering if you have an issue with your bubble bars being too oily? I use pretty much the exact same recipe (converted to the metric system) and the bubble bars are coming out oily. What kind of colorant did you use, and how much? 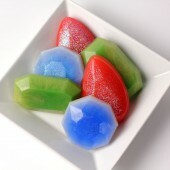 Our La Bomb colorants are glycerin-based, and depending on how much you used, they may be sweating a little bit. This is especially the case in hot, humid climates. I used lab colors that were diluted as suggest on brambleberry….I didn’t measure just added til I got the color I wanted, so it could have been that but those are diluted in water so would they “sweat”? I may also have over done it on the fragrance a little (like I said my scale was being fritzy)…Could that do it? My second batch has not “oozed” or “sweated” so it must be something funky about my ratios. I guess mostly I am wondering if you think they will A) ever dry out properly and B) work ok….? Just made the solid bubble bath and used White Tea and Ginger which was prefect. I noticed in Anne-Marie’s video that the second freezer paper was clean from the dough. I used three and each one had dough on the sheet. 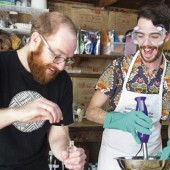 All ingredients were well calculated, should it reduce the wet ingredients by .1 ounce? Also I used Mica, if I want two colors (as on the video) would I have to make two separet batches? Depending on the temperature and humidity of where you live, these can have some transfer on your freezer paper. However, if the end result is a consistency you like you don’t have to alter that recipe. If so, reducing the liquid is a good place to start. Also, you could split this recipe into two and color both halves rather than making two batches. We recommend using our La Bomb Colorants for this recipe, as micas may not mix in well. What is the shelf life of these bubble bars? I’m wanting to make a bunch for the fall festival season, but not sure how far in advance they should be made. 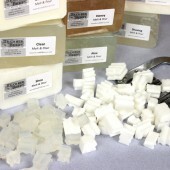 I have a potential wholesale customer who wants to use Argon oil and or Shea butter oil in their line of bubble bars. Is this possible if I just use a little. I have followed the recipe to the letter and it has always turned out perfect for me. Oh, thank you so much for saying that! I’m glad you’re enjoying the blog. Have fun creating more recipes! I’m sorry to hear that your bars are not hardening up! Did you change anything in the recipe? Let me know, I’d love to help! Depending on your climate, I have heard that these bars can take up to a week to fully harden. I made these and they look great for about 24 hours. I made two different batches and on day two of drying they start to turn brown, do you know what I am doing wrong or why they would turn brown? I followed the recipe direction exactly. I used A-M’s recipe for my bubble bars and they turned out perfect!!! First time I made them and I couldn’t be happier with the results! Thank you for all you do!!! Very disappointed. Sounded wonderful. Having used lush products I expected that silky smooth feeling to my bath…. it felt very soapy squeaky clean an very drying…. other than the great smell color an bubbles…. no super silky feeling…. I’ve tried the recipe twice and both times the dough was very very soft. So much so my logs didn’t hold thier shape. Once dry though, the wierd shaped rolls made awesome fluffy bubbles. Would adding a bit more baking soda to the recipe give it some more stability? If you’d like, you could add a little bit more baking soda to give it a little more stability. While we haven’t tried this, my guess is that it would give you the texture you are looking for 🙂 I would recommend making a smaller test batch first to see! Can I mess with this recipe and add citric acid to make it foam on its own when its added to the bath water? Thanks so much for the recipe Anne-Marie! I just made my first batch last night and I’m pretty sure I used too much fragrance oil 🙁 The consistency is not nearly as firm as yours and I wasn’t able to roll it up. Is there anything I can add to the batch to help it harden up or should I just give it some time to hopefully dry out? Oh no, I’m sorry to hear you recipe is a little soft. I would recommend giving it some more time. 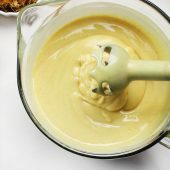 It’s totally possible that they will still firm up 🙂 If the mixture is still in the bowl, waiting to be rolled, you could also add a little bit more dry Cream of Tartar and Corn Starch to dry it up a bit in order to roll it. I hope this helps! That definitely helps! Thanks so much!! Hi! 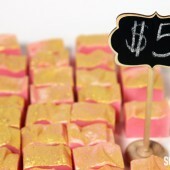 I have made these awesome bubble bars twice. Both times I made the recipe exactly like Anne-Marie’s. 1. They didn’t really harden. 2. They turned brown. I think I know how to make them harden but I’m stumped at the turning brown? Is it just the nature of having vanilla in the fragrance? Would a vanilla stabilizer help? 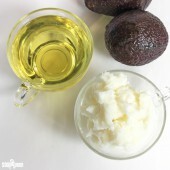 Hi, I am interested on ordering your SLSA through BB since that is the only product I’m missing wit for this recipe, and I’m sorry if here is not the proper place to ask about your product detail but I was wondering about the amount of purity your SLSA has? I didn’t really know the importance of purity in it but my husband wanted to ask about that since he also wanted to use it for other purpose I guess, don’t ask me what it is, he wouldn’t tell really! You can absolutely modify the way you do this. 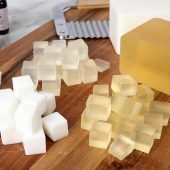 I have been trying several different recipes for these bubble bars and I can NOT seem to get them to harden once made. I followed your recipe and I am not sure if maybe it’s too cold in our house or too much humidity (we live in Montana) but any suggestions or helpful hints would be so wonderful! I am so sad at not being able to give these soft things away! I mean they still work wonderfully but I just want them to be able to be put in cute wrapping! 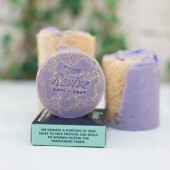 We have found that these bubble bars take a few days, and possibly up to a week, to harden. If it has been less than a week and are still soft, I would give them a few more days :). Let me know how they are in a few more days, I would be happy to help you troubleshoot! Did your bars ever dry out? Was it the cold? I am having the same issues you described. I’m disappointed because I wanted to give mine away as gifts. I love your Bubble Bath Bars, thank you for sharing. 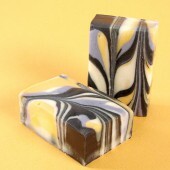 Question, I used some of my own brown coloring for the bars and they turned the bath brown. If I use your colorants will they turn the bath a color? I would like to do a dark brown, what do you suggest I use this next batch…Having fun, loving these. Thanks again. You could also use a small amount of mica, but this may result in a small amount of color in your tub. I love all your receipes but have a hard time finding some of your ingredients. Tapioca powder? Cream of tartar? Vanilla stabilizer? and: the measures: it is really hard to calculate in oz. not very precise. could you think of substitutes for some ingredients and will you -someday maybe- give receipes in metric measures or cups. I bought some cup measures for this purpose. Thank you! And no, ordering from your website would be almost impossible due to high shipping costs and some items cannot be shipped here….. too bad. You can find all the ingredients at Bramble Berry, but you’re correct, sometimes the shipping can make it very pricey. Cream of Tartar should be fairly easy to find at your local grocery store! I have made this recipe twice and each time they never dry. I live in northern New Mexico in a higher altitude and have to adjust my regular baking with extra flour. Could this be what is happening here? I love these and want to make more but not if I can’t get them to dry… 🙁 Has anyone else had this happen before? Thanks!! That could be why you are experiencing the softness in your bubble bath. Did you change anything else from the original recipe? I’d love to try and figure out why it’s not working for you! I’m glad we could help! 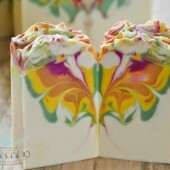 If you get pictures of your soapy creations, we would love to see them on our Facebook page! Were your LabColors diluted? I’d love to help you with this, could you tell me a little more about your methods? While it may not be the color you planned on, luckily the color will not affect your bubble bath :). Here are a few links regarding Lab Colors that you may find helpful! Hello, so excited to try this out! Sorry I’m a little new to all of this but would I need to use the labcolor for the m&p or for the cp because I saw they were for a different ph and Im wanting to do a yellow color. Thanks! Thank you so much fora recipe, i made it today and it looks great! Can’t wait for it to dry out!! We are so excited that you tried out this recipe and can’t wait to hear how it turns out. 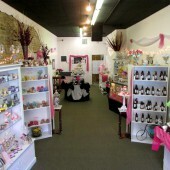 Be sure to share any fun pictures with us on Bramble Berry’s Facebook page. Could you also use Almond oil instead of Castor oil? 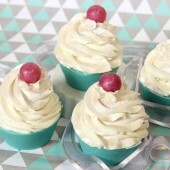 Anne-Marie tested multiple recipes over the last year and finally perfected it to come up with this particular recipe.The Castor Oil really helps to keep it bubbly and the glycerin keeps it from being too crumbly. But, if you are interested in trying out a different solid bubble bath recipe (without Castor Oil), here is one that we did earlier this year. Can you make these in molds rather than free form it? 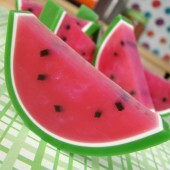 We have found that this particular recipe tends to stick in molds and can tear when you are trying to unmold it. Free-forming it is the best way we have found to work with this particular kind of recipe. I like to use powder color I have that does not stain the tub, but it seems like it would be very hard to divide the dough perfectly, then add half of the liquid to one dough and half the liquid to the other. I’m sure one side would get too much liquid and the other side wouldn’t have enough, and it seems too hard to split the recipe in half from the beginning, so I was wondering, how hard it would be to add powder color at the end? Would it work, it would make it so much easier. Can I color this with a mica?? managed to get them set!! put them next to my aga and hay presto they hardened. and how much would an average bar weigh when ready (approx). Is there something I can substitute for the SLSA? Great question! The SLSA is the main ingredient that is creating the bubblicous bubbles in this Solid Bubble Bath. There’s not too much that can substitute for it, save for maybe SLS, though SLS has a courser particle size that probably won’t incorporate into this recipe as well. Ok, I will give it a try! Thank you for getting back to me so soon. I will try it and see how it works! Go for it! And keep us posted – I’m curious how it turns out. My solid bubble does not seen to want to set hard. It is still soft after 2 days. Do I need a bit of heat or cold to get them to set? Still soft and no sign of setting, will try adding just a little less glycerin! I let them dry out on greaseproof paper. Then on a wire rack. But they sweat where they touch the wire and start to go soft round the edges. Can you substitute bubble bath for the liquid soap concentrate?? I’m very excited to try this recipe for my nephews’ bath time fun! I’m thinking animal shapes. They have sensitive skin and are limited in the number of bubble baths they can take, but little boys need bubbles once in a while!!!! I am wondering about the baking soda+cream of tartar+cornstarch, which is essentially an alkali+an acid salt+ an inert starch. Can I just use baking powder which is, in effect, the same combination? I know cream of tartar is a low temp acid salt, and the sodium aluminum sulfate in baking powder is a high temp (double acting) acid salt. Would this be the issue? Is it that BP doesn’t create the right reaction in the recipe and/or is it too PH neutral? Also, can I substitute the same amount of sodium coco-sulfate for SLSA in the recipe? I know I won’t get the same amount of bubbles, but it is my surfactant of choice for sensitive skin, when necessary. 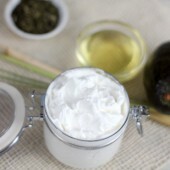 What about some shea butter (0.5 ounces) for extra moisture? Thanks so much for all of your helpful information and recipes. This recipe is so much fun, especially for the kids with all the fun bubbles. If your nephews have sensitive skin, you might want to take the SLS out as it can irritate those with more irritable skin. Just a note, if you do take it out, you won’t have as many big and fluffy bubbles in this recipe. With this particular recipe, Anne-Marie spent over a year perfecting it and found that this was the exact ratio of ingredients to make it work fabulously in the bath. 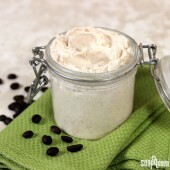 You can add Shea Butter to the recipe, but be aware that it will change the overall texture of the batch. If you’d like to try out your recipe, I would suggest a small test batch to see if works for you. 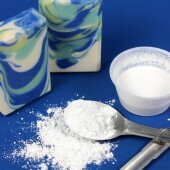 You can also try the following recipe which is a base of Baking Soda, Cream of Tartar and Liquid Soap Concentrate. How many bars does a recipe make? Quick question…I am wondering if any of these ingredients help make the bath water moisturizing? 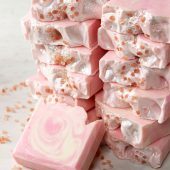 I have only used a bubble bar a couple of times (from a well known brand) and I found the resulting bath to be moisturizing, and that is something that I want to recreate. 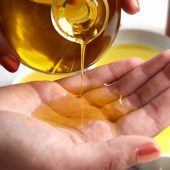 If none of these ingredient are moisturizing, is there an ingredient in this recipe that I could substitute all or part for a moisturizing oil or melted butter? I made this recipe two weeks ago, followed with the video every step and they are still mushy inside and the bubbles are not great at all. I live in a humid area so I run a dehumidifier in my shop to dry my products. no luck with this one, had better results with the simple recipe I found on e how. really was excited to try this. Wish it would have worked better for me. 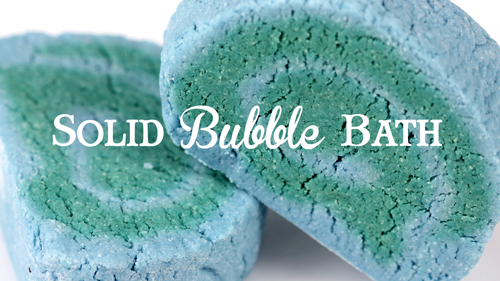 In the meantime, you can check out this other solid bubble bar recipe that Anne-Marie put together. I really love the essential oil blend and loved how it felt in the bathtub. can this be molded into cupcakes? You can totally try to mold this into handcrafted cupcakes. 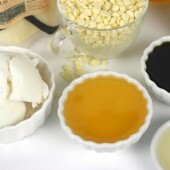 But, we’ve found that this mixture does tend to stick to any molds you use it in — so be aware of that! HI! I love to try making solid bubble bath after watching your tutorial video. However, I cannot find a written instruction (or a recipe) for swirled solid bubble bath. Can you tell me where to find it? Many thanks! We would totally love for you to try this recipe out, and unfortunately at this time we don’t have written instructions for this particular video. 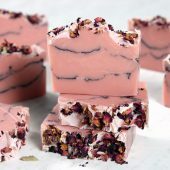 But, you can check out a similar tutorial (with written instructions) from another solid bubble bath bar recipe that Anne-Marie created earlier this year. Are your measurements by weight or volume? Thank you so much for sharing the recipe. I can’t wait to start making more! P.S. If you have any pictures of your fun creations, be sure to share them with us on Bramble Berry’s Facebook page. If I use a cookie cutter to shape these, Do I just pack it tightly into the cutter or pack it on the freezer paper and press the cutter in? If you are using a cookie cutter to shape these, we suggest packing them tightly on the freezer paper and then pressing the cutter in. You definitely want to make sure it is already tightly packed before you use a cookie cutter so that it all stays together. 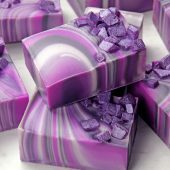 We’d love to see how your solid bubble bath bars turn out, and if you get any pictures be sure to share them on Bramble Berry’s Facebook page. Can you explain the difference between this bubble bar recipe and the other one you have out? Is one better than another for a specific purpose? And does it need a preservative since it has liquid glycerin in it? The recipes just contain different ingredients and have a slightly different final texture. 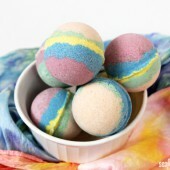 They’re not necessarily for specific purposes, they just give you more options to make different kinds of bath bubbles! And good news, no preservative needed! Hi Becky, thanks for taking the time to write me. I followed the recipe of the main ingredients to a “t” except for the color. I only used a few drops of liquid color on one half of the batch. Everything was looking good for me, consistency just like in the video and rolling went smooth. I cut them after rolling and placed them apart on parchemnt paper so they had room to breathe and dry. We are in day 7 of drying now and although I can pick them up without them denting, they are not dry in the middle. What are your thoughts? 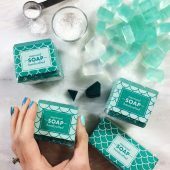 Your solid bubble bath bars sound absolutely delightful! If you have any pictures we’d love to see how they turned out. You can share them with us on Bramble Berry’s Facebook page. My first time posting a comment!!!! So excited watched this video over and over!!! Finally tried my first batch, going on day 5 of drying now and had a question…. My bars are still soft and squishy.. I live in a dry climate so what gives? 🙂 did I do something wrong, use too much of something? Please help…. And thanks AM for everything!!!!!! 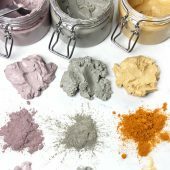 I’m wondering what other colorants you can use in this recipe that are more “natural” and what amounts would I use them in? 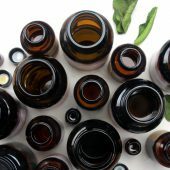 If using essential oils in place of fragrance oils, would I still stick to the same amount? Thank you so much. Just ordered all my supplies today. Can’t wait to try these! 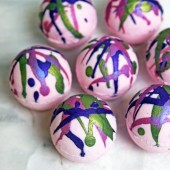 You will just love these solid bubble bath bars — they are a ton of fun to make! 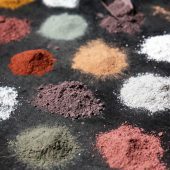 If you are wanting to add more natural colorants to this recipe, it would really depend on which ones you are working with. Typically, I would stick with a smaller amount and move up from there, giving it a WYSIWYG (What You See Is What You Get) glance. 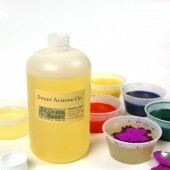 If you let me know which colorants you are wanting to use, I can give you more of an exact amount. 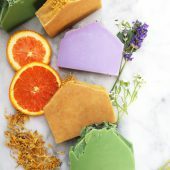 If you are wanting to use essential oils instead of fragrances oils in this recipe, I would suggest using about .25 ounces of EO per pound of mixture. 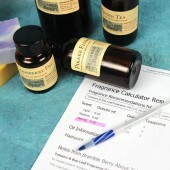 You can also use the fragrance calculator and select salts as the product to get a more exact amount. 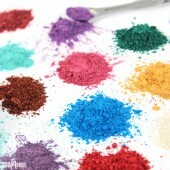 Typically I have on hand Micas, Ultramarines in both powder and liquid or natural colorants like Alkanet Root. I just received my order and have completed my first batch! Absolutely Beautiful!! I can’t wait until they dry so that I can give them out. Was wondering if you might have the recipe in cups, tablespoons etc. I have a scale coming. 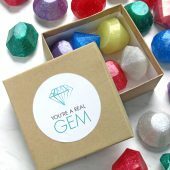 We are so happy to hear that you were able to get your box and make these super fun solid bubble bath bars. With any of our recipes, we use weight (and not volume) because it is a much more precise way of measuring out a recipe. 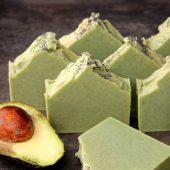 For this particular recipe, Anne-Marie worked for over a year to get these precise calculations so that your solid bubble bath bars would turn out just perfect! You can try using a conversion calculator to get the recipe in cups and tablespoons, but it might not turn out the same. I hope this helps! 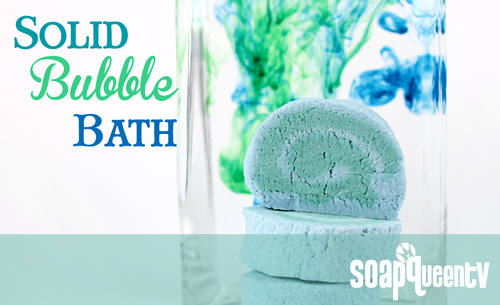 If you have any pictures of your solid bubble bars, we’d love to see how they turned out. You can share them with us on Bramble Berry’s Facebook page. I can’t get these to set up??? This is a major concern, and really would like an alternative if there is one. Thanks for all that you do. Love your site(s)! Thanks for the comment and concern about the SLSA. We have found from study and research that not everyone is as super sensitive to it, but we totally understand why you wouldn’t want to use it in your products. Unfortunately, there really isn’t a natural substitute that will work as well as the SLSA in this recipe. If you want a more natural bubble bath type recipe, I’d suggest checking out this natural bath truffle tutorial. Thanks so much for the reply. I greatly appreciate it. And thanks for the link to the bath truffle. Will check it out. If I make this for retail sale; 1.) what do you think the shelf life is?, 2. )do I need a preservative?, 3.) does the packaging need to be air tight? That’s a great question. You are right; glycol does bind to water making the product not growth friendly. When used at 50%, it’s considered a preservative system in and of itself and the FDA say as little as 10% makes glycerin a preservative system. 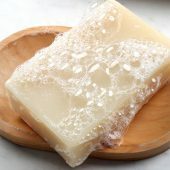 That said, some soapers prefer to use a preservative in anything that contains glycerin because glycerin is a ‘humectant’ which means it draws moisture to itself. 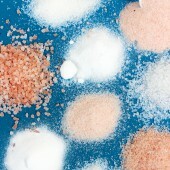 However, lots of things are humectants (salt for example, that don’t need preservative). Finally, glycerin is shelf-stable on its own (as you alluded to) without any preservative. So, what’s a soaper to do!? To preserve or not to preserve? The recipe above contains 19.4% glycerin, well over the 10% threshold for glycerin not being an issue in your product. Regarding wrapping these, I like drying for a week (they’re pretty squishy and unable to travel without a bit of drying) and then you can wrap in cellophane bags or in wax or parchment paper. The wax and parchment paper allow for a bit more breathable which helps to prevent any sort of water clinging. Regarding the shelf life, after one week, the more fresh, the better. I would recommend using this product within 6 months. Wow! You are awesome, A-M! Thank you so much for your thorough clarification! 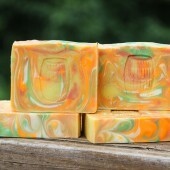 I bow the knee to the Soap Queen! So there really IS a wide % range when it comes to thoughts on the use of a preservative on products containing glycerin. So if your percentage of glycerin is under 10%, use a preservative, and which one depends on the pH. Thank you, too, for the packaging tips and for vouching for Cindy Jones. I already had the Sagescript Institute bookmarked for future use and it’s good to know she comes with your recommendation. When I get to the point where I am selling cosmetic products, I will use her. But now that brings up another question. 🙂 How long after production do you wait before sending a product in for testing? Can it be tested right away, or is there a waiting period to see if any icky bad guys have shown up? 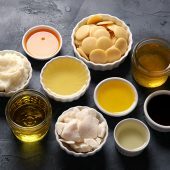 There does tend to be a wide range of thoughts when it come to the use of preservatives, but like A-M said, if you ever want to err on the side of caution, use a preservative in your product. And you are correct, which preservative you use with glycerin really does depend on the pH of the product. We just adore Sagescript Institute and have used them for some time now and have always had great results. On your question about sending your products in for testing, it really depends which test you go with. Most home crafters are going to use the Common Usage Test which is a more affordable test for those with smaller businesses. Thank you, Becky! Much appreciated! I will check it out. I’m curious to know the difference between the Common Usage Test and the more expensive one other than cost. Great video! And OMG you look so beautiful Anne-Marie! Please answer the question about Tapioca Powder. 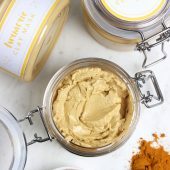 I have all the other ingredients and would like to make instead of waiting for an order t arrive. Can you get something in the grocery store? I’ve used another recipe that includes corn starch. The creator of the recipe recommends potato starch as another alternative. 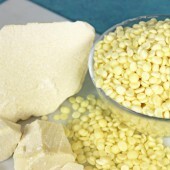 Tapioca starch holds on to fragrance extremely well. I found it at Whole Foods. Hi Mary! As long as you purchase a powder that only has tapioca in it, you should be just fine. There are some out there that have additives and you definitely wouldn’t want to use those in this recipe. We use Tapioca Powder because it holds the fragrance incredibly well, as well as cutting down on any greasy feelings in the product. 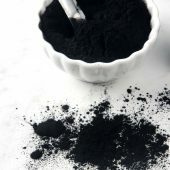 Here is a link to our Tapioca Powder which also has it’s INCI listed, as long as yours matches, you should be just fine! THANK YOU!!!! I’ve been waiting a couple of years for you to do this tutorial!!!! Sounds great! But just wondering about the necessity of needing a preservative since glycerin is a humectant. I’ve read that using ABOVE a certain percentage of glycerin(I’ve seen numbers widely vary…between 15 – 50%,)the glycerin itself becomes the preservative. UNDER whatever that actual percentage is supposed to be, it’s my understanding that a recipe needs an additional preservative. Then there’s the question of packaging. If moisture loss or gain is a problem, shouldn’t it be airtight to avoid moisture loss, keeping them soft, or worse, that “dreaded, icky, bacteria-laden” moisture gain? Shrink wrap maybe? Just wondering if this can be used as a shampoo bar as well? Would be nice to make one like Lush has minus the Sodium lauryl sulfate. This is a timely post as I just got some SLSA. Yay! We are so happy to hear you’ve already tried this out. 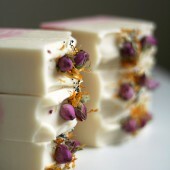 I just adore this recipe and can’t wait to try more color and fragrance combinations out. If you get any pictures, we’d love to see how it turned out. You can share them on Bramble Berry’s Facebook page. I think you will just love this recipe, it was so much fun to see A-M create it and we were just so excited when she found that perfect combination of ingredients. Keep us updated on your progress! We’d love to see how it turns out for you, if you get any pictures be sure to share them on Bramble Berry’s Facebook page. I was just wondering, do the lab colors come already diluted, or do you have to dilute them yourself? Is there a guide to diluting them? Good morning, Leanne! La Bomb colorants should work just fine in this recipe, but you might need to use quite a bit more to get the same color saturation we did with the LabColors. You’ll have to keep us updated on your progress. If you get any pictures, you can share them with us on Bramble Berry’s Facebook page. For people concerned with sulfates and synthetics, SLSA is NOT a sulfate and be aware that Anne Marie was mistaken when she called Sodium Lauryl Sulfoacetate synthetic. SLSA is safe skin botanically derived surfactant (foaming agent) excellent for both skin and hair products that produces a rich lather. It has a large molecular size which will not absorb into the skin or mucus membranes, such as sulfates do (they have a small molecular size), and thus it is non-irritating to those parts of the body – with an upper threshold of about 70% for skin products such as bubble bath. In shampoos, to avoid eye irritation, it should not make up more than 3% of the product volume. The chemical name, when broken down to it’s constituent components tells you what it is made of. Sodium: a solid mineral salt – It acts as the counterion (pronounced as two words, “counter ion,” but should always be written as one word) – It simply maintains the electrical neutrality of the molecule. i.e. no INHERENT static charge. It works exactly the same way as it does in sodium chloride (table salt), which is a conductor, but has no inherent static charge. Lauryl: Chemical shorthand for Dodecanol, aka Lauryl Alcohol – This is the hydrophobic (repelled by water) part of the molecule. On it’s own, it is a colourless, water insoluble solid obtained from the reduction of coconut, palm and/or palm kernal fatty acids (oils) combined with methyl esters (natural organic compounds). It has a slightly sweet, floral aroma. Sulfoacetate: The hydrophilic (attracted to water) part of the molecule. A combination of sulfur and acetate (present in all biological cells and necessary for biosynthesis – the process cells use to make other chemical compounds to grow and feed other cells in the body – aka, a building block of life). 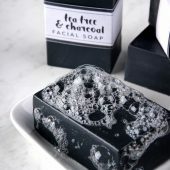 The sulfur is there to help the acetate create stable bubbles and soft lather. Thanks for your note! It’s great; so much fantastic information. My personal opinion is that the product is a synthetic but I also have a fairly strict definition (which isn’t a legal definition as we know) of what defines natural and not natural. My thinking is: If you can create it with minimum effort in nature (i.e. boiling an herb to get the essential oil or grinding the nut to get the oil), it’s natural. If you have to react things in a lab and there’s zero way to make it from what is available from nature, it’s not what I consider natural. I understand what you are saying and I agree. I would not call SLSA “natural” either, but that does not make it synthetic. It’s not a black and white world. there are a billion shades of grey and perspective certainly matters. Personally, I find the term “botanically derived” to be the most accurate in this case. Great definition A.M. I totally concur. As a biochemist I have to agree with Anne-Marie, SLS is not considered Natural. That doesn’t mean the origin is not from plant, but all molecules come from nature. From the chemotherapy drugs I use to surfactants. If the base structure is found in nature, but then we modify it chemically then it is not “natural”…it is a derivative of a natural phytochemical. That doesn’t mean it’s not safe..just that is has been altered and most of the time altered to become more bioavailable, more stable, and most of the time safer. 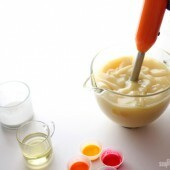 Will this recipe work in silicone molds or do they fall apart when you take them out? Thanks so much for sharing your recipe! You saved me years of trial and error trying to develop a recipe that I can be happy with. When I use one of your recipes, I know your knowledge, expertise, and creativity went into it to make it great. I have been anxious for this recipe ever since you said you were working on one. Even though I’ve been waiting on the edge of my seat :-), I appreciate that you didn’t put the recipe out there for us to try until you got it just right and were pleased with the quality of the finished product. Hi Jean! Thanks for the comments. We can’t wait for you to try this recipe out. It is just so super bubbly and fun in the tub. I was lucky enough to be one of the testers for this and can’t get enough of it. =) Keep us updated on your progress. What is the recommended amount of the bubble bar for one bath? Hello, I have a question, is it obligatory to add cream of tartar and can it be substituted with something else? Another question is about tapioca powder, can this ingredient be substituted with another ingredient (we don’t have tapioca powder where I live:)? Last question about SLSA, is there any other ingredient that doesn’t contain LS that can be added instead? Many thanks! Been waiting sooo long for this tutorial! YAY! Off to watch it now! Woo! That was so awesome! I am off to order the ingredients now. Well I have most already, so just a couple. 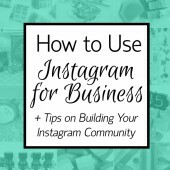 I was so engrossed in this video that when you asked, “Do you want to see how it works?” I found myself nodding yes. Ha! Leslie – I am right there with you! We’ve tested multiple recipes over the last year and have perfected it to this one. 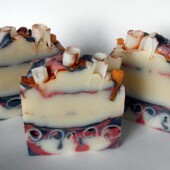 The Castor Oil really helps to keep it bubbly and the glycerin keeps it from being too crumbly. But, if you are interested in trying out a different solid bubble bath recipe (without Castor Oil), here is one that we did earlier this year. Thanks! Is tapioca powder the same as tapioca starch/flour? Yaay! Its finally here! Thank you so much Anne Marie! I been waiting for a solid bubble bath tutorial from BB. Going to do this in the coming weeks. Will post pics!